Director: Ryan Coogler. 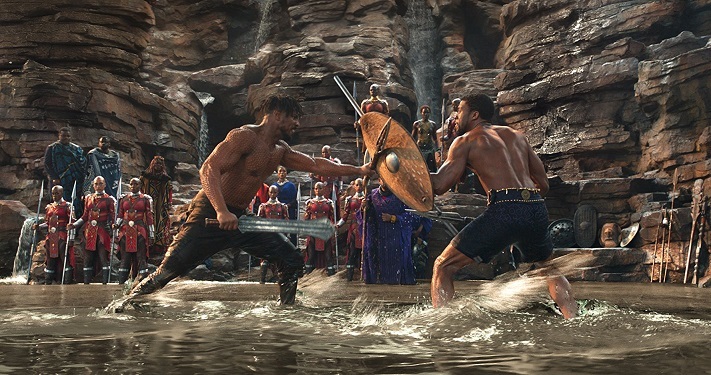 Cast: Chadwick Boseman, Michael B. Jordan, Danai Gurira, Letitia Wright, Lupita Nyong'o, Daniel Kaluuya, Angela Bassett, Forest Whitaker, Winston Duke, Sterling K. Brown, John Kani, Denzel Whitaker, Seth Carr, Martin Freeman, Andy Serkis, Florence Kasumba, David S. Lee, Nabiyah Be, Atandwa Kani, Ashton Tyler, Connie Chiume, Isaach De Bankolé, Francesa Faridany, Sebastian Stan, Stan Lee. Screenplay: Ryan Coogler and Joe Robert Cole (based on the comic series by Stan Lee and Jack Kirby). Twitter Capsule: Exhilarating blend of action and thought. Some Marvel limitations persist but a tinted-glass ceiling gets shattered. Second Capsule: So ambitious, accomplished, and poignant in many respects, even if lighting, effects, action sequences get bumpy. VOR: ⑤ Wrenches the Marvelverse into social relevance and worthy debates. Tensions between African and diasporic blackness, refitted as blockbuster material! Best Original Song: "All the Stars"